Imphal, Dec 28: The delegation of leaders of civil society organizations from the state that has been camping in Delhi for the last couple of weeks to lobby its stand on the framework agreement between the Centre and the NSCN-IM met with Prime Minister Narendra Modi this noon and presented its position on the matter during a meeting which lasted around 15 minutes. The leaders lauded the prime minister for what it described as the latter’s apt understanding of the prevailing state of affairs in the state. In a press release issued by the CSOs, a memorandum was submitted to the prime minister along with a figurine of Kanglasha and a leiyum phi. During the meeting the state’s delegation reportedly told the prime minister that despite repeated assurances from leaders of the Union government including Narendra Modi himself that the territorial integrity of the state will not be compromised, enough apprehension has been created in the mind of the public due to the negative assertions from different circles on the issues and the failure of the Centre to reveal the true content of the frame work agreement. The prime minister asked the delegation to identify the party that is causing such apprehension. If the Centre has been creating such apprehension, he told the delegation, there is no need for its continuation as it has never made any public statement about such intention. In such circumstances, there is no cause for alarm, Narendra Modi reportedly told the delegation and appealed to the latter to stop paying attention to false rumors. When the government is ready to make an official position on the issue it will definitely come out with a statement at the right juncture. The centre has kept its doors wide open for suggestion from the side of the CSOs from Manipur as well and it will entertain all suggestions, he said urging the members of the delegation to forward their opinions accordingly. The delegation told the prime minister that it will not be acceptable to any stand which could lead to disintegration of Manipur in the far future even if the Centre announces measures to counter such situation in the immediate future. Modi said a viable solution for bringing peace and tranquility in the state is ensuring its economic development, reminding that Manipur is one of the least economically developed states in the northeast region, and soothed the delegation to return home without any worry. Mass media in today’s world is playing tremendous role in bringing up issues which they think is for the cause of the common people. India is not lagging behind; there have been many cases that common people who were victims of atrocities have been delivered justice. Many God men had been put behind bars, business tycoon are declared wanted and many politicians are also not spare for the wrongs they had committed which affect the livelihood of the common people by those in media risking their lives. Paid news, reporting of cooked stories and yellow journalism are some of the familiar words coined to defame the people in mass media by those who had been exposed for their wrong deeds. Saying so it does not meant that some people in the profession are pure and sincere in rendering their duty. The mass media in this little state Manipur too has been playing its role effectively. Without bothering the kind of returns they enjoyed as payment to their service, people in this profession have been taking all risk in exposing what is not right when it comes for the common people. 8 people in the field had lost their lives some remain as disabled in unfortunate accidents and incidents when they were on duty. Inappropriate salary in returns to their service had also forced many to quit the profession. Yet there is no shortage of manpower in this field. From hand written pamphlets to letter press and then Offset printing machine and then come multicoloured Web printing machines besides the emergence of Television channels, mass media in Manipur too is marching ahead. Now it is the digital media that is slowly dominating the world of mass media. The traditional way of spreading news has been slowly changing converting the system to two ways channel– as both receivers and senders can communicates in a nick of time. 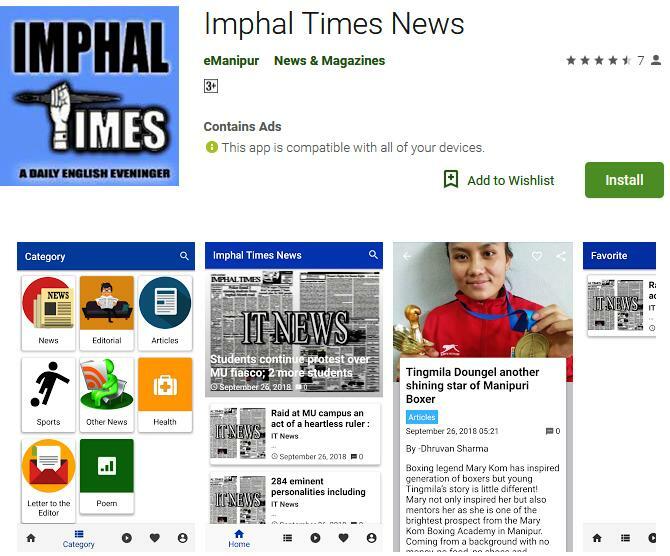 The changing media trends showed that criticism, debate, arguments will be the future of media and it is already doing at many of the national and international media, even though it still seems way to go for the state of Manipur. Saying so, it would be wrong to advocate a free speech from any individual or freedom of press without limit as legitimate. In democratic India a breached of privilege for some individuals or groups by any mass media can be challenged, but taking the law in hand to stand up or protest against any trespassing to individuals or groups is rather a sign of lawlessness. Government’s silence on such matter will only be recorded as weak or inefficient, by the future generation. A hurriedly managed staged demonstration by any groups including political parties or media or anybody driven by emotion and sentiments is not a signed of civilize society. Imphal, Dec. 28: On 27 Dec 2017, a Symposium was organised by Senapati Brigade under the aegis of Red Shield Division. Symposium provided the intellectuals and youth from different ethnicities, a platform to express themselves freely and share their view point on developing harmonization in Manipur. The Symposium was conducted for a total duration of four hours in which eight speakers representing different ethnicity and profession expressed their views on the theme “Inclusive economic development will usher in ethnic harmonization in Manipur”. In addition to this, five eminent expert panelists also gave their experts comments followed by question and answer session on the topic. It was a very comprehensive debate and discussion which brought out very practical and relevant steps needed to be initiated by Govt, Socio-Political orgs, and all other stakeholders to bring harmony and peace in Manipur. More than 200 people which included number of socio-political leaders, youth from different parts of Manipur, Govt Official and personnel from different media streams attended the Symposium and benefitted from the views expressed by speakers and panelists on the topic. In the end, all speakers and the panelists were felicitated by the Chief Guest, Maj Gen U Suresh Kumar YSM, VSM, GOC 57 Mtn Div. During the conduct of Symposium, Prof N Mohendro Singh, in his opening keynote address, said that academic intervention is most effective in leading to far reaching changes in society and this effort of the Army will go a long way in that direction. Ms Thokchom Sylvia Devi, Social Worker and National Youth Volunteer, while speaking against the motion, said that development alone will not bring harmony. We need to remove illegal taxation, corruption extreme lack of quality education, as it hurts the common people most. Due to presence of these ills, no effective development canl take place. Mr Kh. Shiile Anthony, Director HRD NEC Shillong, said that the trust deficit between various communities need to be bridged to achieve both development and harmony. He also said that Armed Forces, who represent convergence of diversity, should take initiative and help various communities come together in Manipur. Ms Bountia Keishing, Social Worker and a Business Entrepreneur, stressed upon the need by government to give suitable knowledge to people and also stressed upon importance of people participation in the development process. Professor Amar Yumnam, HOD of Economic Manipur University, while summing up the Symposium, stressed upon the importance of such a gathering to generate ideas. He also mentioned a need to get out of living in the past and look and plan for the future. Maj Gen U Suresh Kumar, YSM, VSM, GOC Red Shield Division, in his concluding remarks said that it was a privilege to listen to speakers from various communities and each having amazing knowledge. He stressed upon the importance of harmony amongst different tribes as a pre requisite to achieve sustained development and ever lasting peace in Manipur. The event concluded with a vote of thanks by Brig Dipankar Saha, Senapati Brigade. Imphal, Dec 28: Works Minister Thongam Biswajit Singh on Wednesday inaugurated the XVth Oinam Hill Youth & Students’ Organisation Annual Tournament at Oinam Hill Village, Senapati District. The Minister also unveiled a monolith of the tournament. Minister Biswajit said that sports help in creating a disciplined and healthy society. Sports is part of education and there are so many things that we can learn from sports, the Minister said. Expressing pleasure on seeing youths gathered for the annual tournament, the Minister said that the youth play a significant role in the society and that it is a delight for him to interact with the youth. Meanwhile, assuring all possible assistance, the Minister also urged the local leaders to approach the concerned Sports Minister and enquire about provisions of the Khelo India Scheme which they can avail. Minister Biswajit also explained several schemes of the government implemented for the welfare of the State. Explaining the Mission for Economic Empowerment of Traditional Artisans and Craftsmen, the Minister, who also holds the Commerce and Industries portfolio said that the mission was conceptualised and implemented with the objective to promote the local artisans, craftsman and their products. He said that products of the State’s weavers are of good quality and at the same time the inability to market these products in the international market has only bogged down the artisans and craftsmen. The Mission has been implemented to provide an online market for the products and give outside exposure to the artisans. The Minister also explained other schemes like the Pradhan Mantri Awas Yojana, UJALA-for affordable LED bulbs and UJWALA-to provide cooking gas connection. Meanwhile, responding to memorandums submitted by the locals, the Minister said that he will see if construction of the Besho to Oinam Hill Village Road (12 km approx.) can be taken up under the PMGSY and if it is not feasible than the same will be undertaken under the PWD. Regarding construction of road connecting Oinam Laila Village and Ngamju Part I and another construction work from Oinam Laila to Ngamju Part II under the PMGSY Phase X, the Minister assured to send a team of engineers by first week of January to inspect the constructions and at the same time assured early completion. As part of the inaugural function, Naoriya Pakhanglakpa MLA Soibam Subhaschandra Singh also released a theme song of the tournament. Imphal, Dec 28: Despite having a state policy to discontinue service extension of retired officers, process for service extension or re-engagement of K. Lokeshore Singh, Additional Chief Engineer of Command Area Development Department by promoting him as Chief Engineer has irked the employees of the office. The All Manipur Command Area Development Employees’ Association (AMADEA) had once again submitted a memorandum to the Chairman of the Manipur Public service commission to examine the legality of giving promotion to K. Lokeshore Singh as Chief Engineer of CADA under the Manipur Civil Engineering Service (PWD) Rules 2016, Scheduled – III, rule 7 (ii) which stated clause for regulation of CADA. The Employees’ body said that K. Lokeshore is not even qualified for the post of the Chief Engineer, keeping aside the violation of the state policy for extension of his service as he is in charge of the Additional Chief Engineer. He joined the office as in charge of Superintending Engineer , CADA without any extra remuneration till the post is filled up on regular basis by an order of the Governor of Manipur dated 10th September, 2015. The state cabinet decision taken on 18th of December, 2017 to re-designate the post of Additional Chief Engineer (CADA) as Chief Engineer (CADA) by one time selective adoption of the Manipur Engineering Service (PWD) Rules 2016 which is likely to facilitate double promotion to K. Lokshore has created apprehension to the Employees’ Association of CADA. The employee body said that K. Lokeshore, in-chrage SE is not eligible to even be promoted as Additional Chief Engineer as per the existing Recruitment Rules. Lokeshore, the present in-charge Additional Chief Engineer will retire on December 31, 2017. As there are various other junior officers with year long experience, re-engaging him and that too by giving double promotion to him will be nothing but committing injustice to the junior officers of CADA. As source revealed about the process being underway, a legal notice has also been served to the Principal Secy. (CAD) Government of Manipur requesting him not to allow the extension or re-engagement of the Head of Department of the CADA following retirement on supernuation on December 31, 2017. Spokesperson of the Government of Manipur , Th. Bishwajit had already stated that the state government will discontinue re-engagement of retired officers. The legal notice to the Principal Secretary (CAD) stated that the extension / re-engagement of the employees after retirement is against the principles laid down by the Supreme Court of India and is in violation of the law of the land. It further stated that fundamental rules 56 as applicable to the employees of the Government of Manipur clearly provides that no government servant shall be granted extension in service beyond the age of retirement. Imphal, Dec 28:The 2018 edition of the historic Indian Science Congress will be held at Manipur University, Imphal, in March. The event was scheduled at the Osmania University (OU), Hyderabad, in the first week of January but had to be moved out due to “security problems.” This was the first time the 106-year-old ISC — the largest congregation of scientists in India — had to be postponed at the last minute. “We’ve got confirmation from the Governor as well as the Chief Minister’s invitation to host the event at Manipur University,” Prof. Gangadhar, general secretary (Membership Affairs), Indian Science Congress Association (ISCA) said. They would soon be writing to the Prime Minister’s Office about the dates. The congress sees several students, Nobel Laureates and scientists from India’s science academies in attendance. Fresh registrations would now be required, Mr. Gangadhar said. Since the days of Jawaharlal Nehru, the ISC was traditionally the 1st public function the PM addressed in the calendar year. Imphal, Dec. 28: CAF&PD, Revenue, Relief & Rehabilitation Minister Karam Shyam today suspended four Government officials in connection with the irregularities in the utilisation of land resources,records and public assets. The decision was taken in consultation with the State Revenue Commissioner Th. Chittaranjan & other concerned high ranking officials of the Department after detailed inquiry and proper, thorough investigation of the irregularities and public offence committed by the culprits. The suspended officials are N.Suran Singh,SDC Imphal West Central; O Dhanabir Singh,Circle Mandol, SDC Office, Imphal West Central; Th Ibomcha Singh Singh, Supervisor Kanungo(just recently transferred to look after SDC/SDO Office, Chandel) and Shri A Iboton Singh, Supervisor Kanungo, i/c Registrar Kanungo, Directorate of Settlement & Land Records, Government of Manipur. Talking to media persons, Minister Karam Shyam said that he received several complaints in relation to improper land resources utilisation & its mismanagement from the public during his 9 months tenure as Revenue Minister. Suspending the above four officials for misutilising land assets that is a public property for their own personal profits and interests, he stressed that stern action would be taken against those who misuse public assets wrongly and found guilty. During a press meet held at the conference hall of the Minister’s Office, he stated that both SDC Suran and mandol Dhanabir are responsible for wrong entry of Tarunibala’s mother as dead instead of alive regarding land property entitlement and it would be justified on the part of the Government to punish them for distorting facts and their involvement in the matter. Th Ibomcha is suspended on charges of irresponsible behaviour in connection with irregularities regarding 33 Khangabok land records, the Minister accused. There are also cases of computerisation and manipulation that the revenue officials of the State are looking into in detail from time to time. A Iboton misused the dakshitha(patta) legal papers of the Sports University that is a state/National property without prior permission of the concerned higher authorities, Revenue Minister Karam Shyam said. The Minister awarded a cash prize to Ningthoujam Ibochouba, zilladar, SDO Office, Bishnupur for his sincere service regarding revenue tax collection of Rs.50,000 within a short span of 10 days. Drawing serious concern that the Revenue Department is not having a good image in the public eye, the Minister assured that his Department shall abide strictly by the law and order and norms of the State and conveyed the message that concerned officials should not commit such irregularities in future to pursue personal motives. State Revenue Commissioner Th. Chittaranjan;Special Scretary Revenue, M.Joy and Deputy Secretary Revenue, Y Rajen Singh attended the press meet.